It is recommended to bypass empty staves during processing. This will slightly increase the processing speed. By default this is set to "bypass". The dialogs and warning messages of the Perfect Layout plug-in can be bypassed for example to allow batch processing. IT IS NOT RECOMMENDED THOUGH! Especially if one doesn't use the Perfect Layout plug-in on a daily basis, it is very likely that one forgets to do some of the preparations before running the plug-in. If you have bypassed the main dialog, you can only reset it by deleting its .ini-file. It is located in the same folder as the Finale® configuration files (typically C:\Users\USERNAME\AppData\Roaming\MakeMusic\Finale) and is called "JALAYOUG.ini". Simply delete the JALAYOUG.ini file and restart the plug-in. Then the main dialog will reappear. It's possible to bypass AutoHotKey (i.e. to not show the progress bar and to not minimize Finale®), but it is not recommended as it massively slows down the processing of the plug-in. 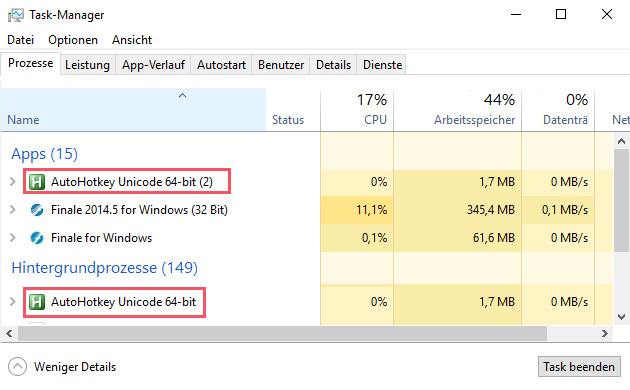 If you don't want to see the progress bar, you can also kill the two AutoHotKey tasks (AutoHotKey Unicode 64-bit and AutoHotKey Unicode 64-bit (2)) in Window's task manager. Attention: You have to maximize the Finale® window manaully if you kill the tasks and probably you won't notice when the plug-in has finished. The plug-in creates a log file that includes the current progress of the plug-in and actions that might be interesting to the user (e.g. detected problems, expressions that were moved to a new measure position, etc.). Usually you don't have to consult this log file. But it may be interesting if you have a corrupt Finale® file and try to repair it with the Perfect Layout plug-in or if you are new to the plug-in and want learn a bit more of what it does. The option "Open Log File After Processing" is unselected by default. More about the log file can be found in the FAQ. The plug-in can automatically check for updates. Though it is recommended, it is deactivated by default for data privacy reasons (GDPR). You can also check manually by clicking the "Check for Updates Now!" button.